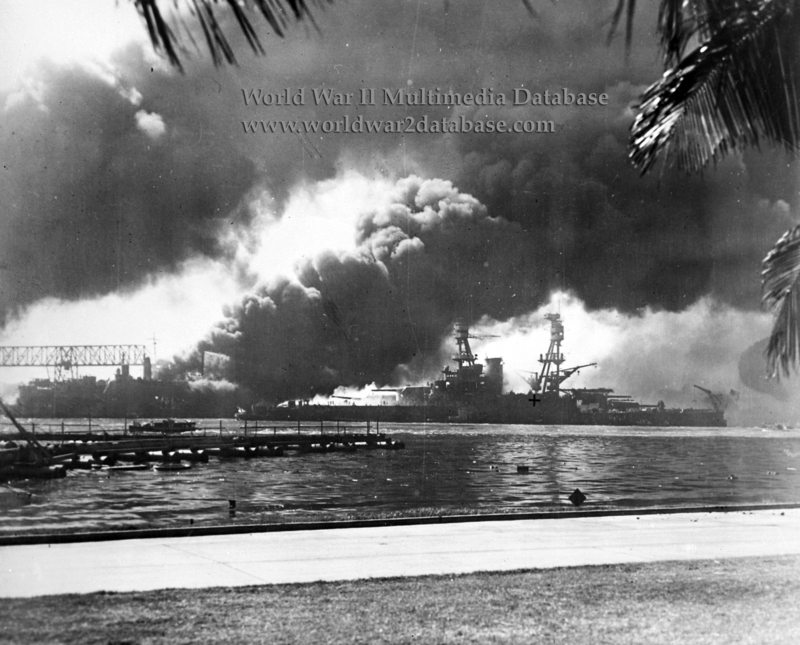 USS Nevada (BB-36) afire off the Ford Island seaplane base, with her bow pointed up-channel. USS Shaw (DD-373) is burning in the floating dry dock YFD-2 in the left background. Photographed from Ford Island, with a dredging line at left. Nevada was the eldest (by a few months) of the battleships in Pearl Harbor on December 7, 1941. Onboard the USS Nevada, the ship's band was just starting to play "The Star-Spangled Banner" during the daily flag-raising ceremony when the Japanese attacked. She was hit by one torpedo during the last part of the Japanese torpedo planes' attack at 0810 Hours. This opened a large hole in the ship's port side below her two forward turrets. Her anti-torpedo protection, of a type back-fitted to the Navy's older battleships, resisted the warhead's explosion fairly well. However, serious leaks were started in the inmost bulkhead, allowing a considerable amount of water into the ship. Without tugs, the damaged Nevada got underway at 0840, backed clear of her berth, and began to steam down the channel toward the Navy Yard. The slowly moving battleship was an attractive target for Japanese dive bombers, which hit and near-missed her repeatedly, opening up her forecastle deck, causing more leaks in her hull, starting gasoline fires forward and other blazes in her superstructure and midships area. Now in serious trouble, Nevada was run aground on the Navy Yard side of the channel, just south of Ford Island. As her crew fought her many fires, the ship twisted around until she was facing back up the harbor. With the help of tugs, Nevada then backed across the way and grounded, stern-first, on the other side of the channel. Her old, much-modified structure proved itself to be anything but watertight, and water traveled inexorably throughout the ship. By the following day, she had settled to the bottom, fortunately in fairly shallow water. There she was to remain for over two months, the subject of one of the first of Pearl Harbor's many demanding salvage projects. Of USS Nevada's crew of nearly 1500, fifty officers and men were killed in action during the Pearl Harbor raid.